When I first tasted these shrimp, my response was “best shrimp ever.” To be honest, I’m prone to hyperbole. However, this time I wasn’t exaggerating. These were the most exquisite shrimp I’ve ever tasted. The quality of the shrimp themselves wasn’t particularly high: they were frozen farmed shrimp from Trader Joe’s. The blessing and the curse of shrimp is that they have a relatively mild flavor. Shrimp just don’t taste particularly much like shrimp. And, frankly, most shrimp applications are lacking. I wish I had the idea of making a shrimp stock to use in the sauce to go with the shrimp. It makes perfect sense: it’s similar to using chicken stock for pan sauce for chicken. But, because shrimp are so small, the flavoring of the stock goes even further. The shrimp manage to absorb a lot of the flavor from the shrimp stock even though they’re only cooked in it briefly. With apologies to Julia Child, the shrimp tasted more shrimpy. The recipe itself is pretty straightforward. You make a shrimp stock with the shrimp shells. 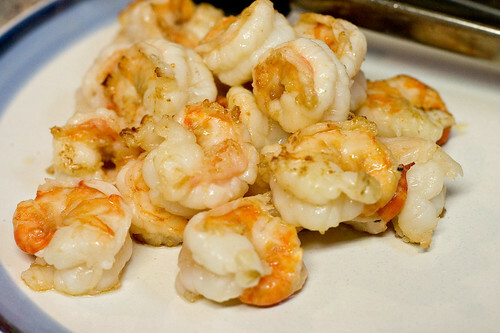 Then the shrimp are pan-fried in olive oil and a reduction is made with some garlic and the shrimp stock. The only modification I made to the recipe were to use dry vermouth instead of white wine and to brine the shrimp. If you think that brining poultry makes a difference, wait until you try it on shrimp. It improves the texture immensely and it also means that there’s a larger window for cooking the shrimp in. It also doesn’t take very long which is nice. If you like shrimp, I implore you to try this recipe. It really is that good. 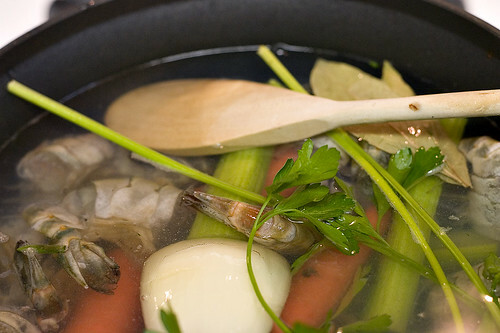 Combine all the ingredients for the shrimp stock in a sauce pan. Cook at a high simmer over medium-low to medium heat for 1 to 1 1/2 hours or until the shrimp stock is reduced to 1 cup. Drain the stock through a strainer and reserve the stock. This can be prepared in advance and the shrimp stock refrigerated until used. Put 1 cup of water, the kosher salt, and the sugar in a sauce pan over high heat. Stir the contents until the salt and sugar are desolved in the water. Remove from the heat and pour into a heatproof bowl. Add the ice cubes. When the brine is cool, add the shrimp for 15 minutes. Remove the shrimp from the brine and pat dry. In a large sautée pan, heat the olive oil over medium-high heat until just before smoking. Add the shrimp and cooked until they are lightly golden on both sides, about 1 to 2 minutes per side. Remove the shrimp to a plate. Add the garlic to the pan and cook until the garlic is golden, about 1 minute. Add the vermouth and the shrimp stock. Increase the heat to high and reduce the stock until it is a medium consistency. Taste for seasoning. 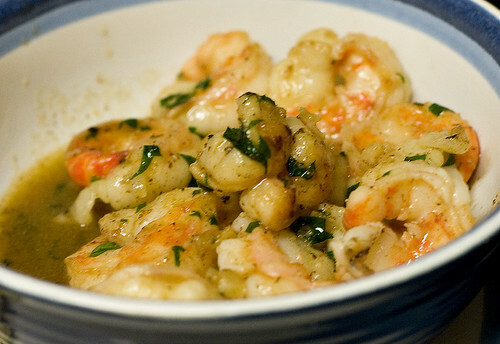 Reduce the heat to medium and add the shrimp, butter, and parsley. Mix the contents well and cook for 1 minute more. Serve the shrimp in bowls with good bread.